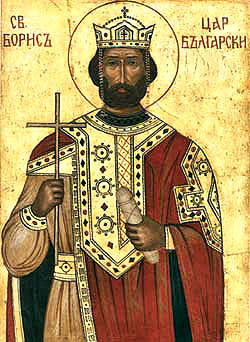 Tsar Boris I of Bulgaria, also known as Boris-Michael, was the ruler of Bulgaria during the latter part of the ninth century as the Knyaz of the Bulgarian Empire and led the conversion of the Bulgarian people to Orthodox Christianity. He ruled from 852 to 889. 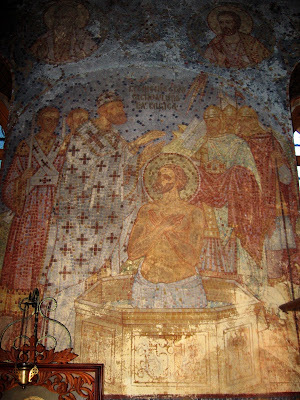 Saint Boris is commemorated on May 2 and is remembered as Equal of the Apostles, Prince and Enlightener of Bulgaria. His father, Presian I, was the Khan of Bulgaria, a realm that had expanded during the prior centuries in the northeastern Balkans. The development of the Bulgarian Empire took place against the Frankish realms in the West and that of the Romans in the southeast. This Boris inherited in 852. Populated by proto-Bulgarians together with Slavic tribes, the population of the realm consisted of diverse religions, ethnicities, and languages that Boris looked to unify by the introduction of a common and compulsory religion for all his subjects as one of the preconditions for the formation of a united state. The apostolic deeds of Boris were foretold by an uncle, Saint Boyan. The first years of the reign of Tsar Boris were marked by misfortune. The Bulgarians were frequently at war with surrounding nations, famine and plague beset the land, and in the year 860 Bulgaria found itself in dire straits. Tsar Boris saw the salvation of his land, which was darkened by paganism, in its enlightenment by the Christian faith. During one of the battles of the Bulgarians with the Romans he captured the illustrious courtier Theodore Kuphares, who had become a monk. He was the first man to plant the seed of the gospel in the soul of the Bulgarian tsar. In one of the campaigns with the Romans the young sister of Tsar Boris was taken captive, and was raised in the Orthodox faith at the court of the Roman Emperor in Constantinople. When the emperor Theophilos died, Tsar Boris decided to take advantage of this circumstance to take revenge upon the Romans for his former defeats. But the widow of the emperor, Theodora, showed courage and sent a messenger to the Bulgarian tsar saying that she was prepared to defend the Empire and humiliate its opponents. Tsar Boris agreed to a peace alliance, and Theodore Kuphares was exchanged for the Bulgarian princess, who influenced her brother toward Christianity. A while later Saint Methodios was sent into Bulgaria. He and his brother Saint Cyril were enlightening the Slavic peoples with the light of Christ. Saint Methodios baptized Tsar Boris, his family and many of the nobles. When the pagan Bulgarians learned of this, they wanted to kill Tsar Boris, but their plot was frustrated by the tsar. Deprived of their rebellious leaders, the Bulgarian people voluntarily accepted Baptism. A peace was concluded between Byzantium and Bulgaria, based on their unity in faith, which was not broken until the end of the reign of the noble tsar. The Patriarch Photios (Feb. 6) took great interest in the spiritual growth of the Bulgarian nation. In 867, preachers from Rome were sent into Bulgaria. This led to three years of discord between the Churches of Rome and Constantinople in Bulgaria. A Synod at Constantinople in 869 put an end to the quarrel, and on 3 March 870 Bulgaria was joined to the Church of Constantinople, and Orthodoxy was firmly established there over that of Frankish innovations. Bulgaria’s holy ascetics: Saints Gorazd (July 27) and Clement of Ochrid (July 27) were glorified as Saints. Tsar Boris adorned the land with churches and furthered the spread of piety. A skillful diplomat, Boris successfully exploited the conflict between the Patriarchate of Constantinople and the Papacy of Rome to secure autocephaly for the Bulgarian Church, thus dealing with the nobility's concerns about Roman interference in Bulgaria's internal affairs. In his declining years, Tsar Boris entered a monastery, leaving the throne to his sons Vladimir and Simeon. While in the monastery Boris learned that Vladimir, who succeeded him, had renounced Christianity. Distressed by this, Boris again donned his military garb, punished his disobedient son and threw him in prison. After giving the throne to his younger son Simeon, Saint Boris returned to the monastery. He left it once more to repel a Hungarian invasion. These changes were affirmed at the 893 Synod of Preslav that also banished the Roman clergy and replaced them with Bulgarian clergy. Also, the Synod moved the capital to Preslav and replaced the liturgy in Greek with one in Old Church Slavonic as the official language of the Bulgarian Church and the state. Saint Boris, who was named Michael in holy Baptism, reposed on May 2, 907.